Your style will bloom when you wear jewelry from the Tacori Lilac Blossoms collection! The name of the line stems from the lovely lilac, pleasant purple and lush blush hues that unite in feminine rings, bracelets, necklaces, pendants and earrings. White chalcedony and sparkling diamonds serve as accent gemstones. Crafted in sterling silver, many pieces showcase the classic Tacori gem seal in yellow or rose gold. Take a look at a light and airy floating gemstone cuff, a bangle with jewel stations, and a multi-gemstone strand bracelet. Lend your eyes (and ears!) to stud, hoop, drop and chandelier earrings. Check out a circle- and floral-motif necklaces. Look at single-, two- and three-stone rings, along with a captivating cluster! 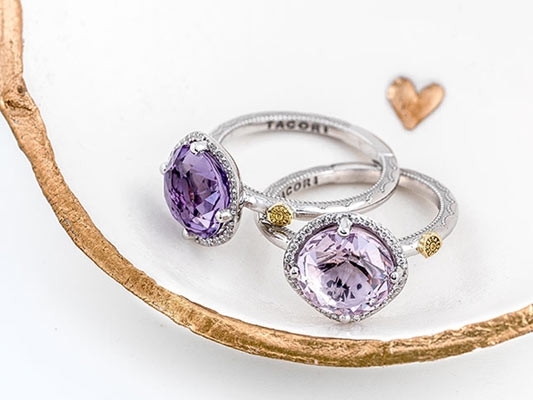 As sweet as a breath of spring, the radiant pieces of the Lilac Blossoms collection from Tacori are sure to impress.